In this Free Cisco Lab scenario you will use Packet Tracer to configure 10 routers to use IPV6, enabling IPV6 on each router, and assign each router an IPV6 address. 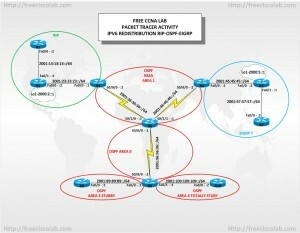 You will then configure RIP, EIGRP, and OSPF as shown in the provided network diagram. You will then redistribute the RIP, OSPF and EIGRP routing protocols over the network. Finally you will use Ping, Debug, and Show commands to verify the operation and connectivity of the network. Learn to assign IPV6 addresses. Learn to configure IPV6 EIGRP routing. Learn to configure IPV6 OSPF routing. Learn to configure IPV6 RIP routing. Learn to use the Ping, Debug, and Show commands.